This emulsion helps eliminate scales, soothe irritations and calm redness. Gentle, moisturizing and well tolerated, it can be used as often as needed. 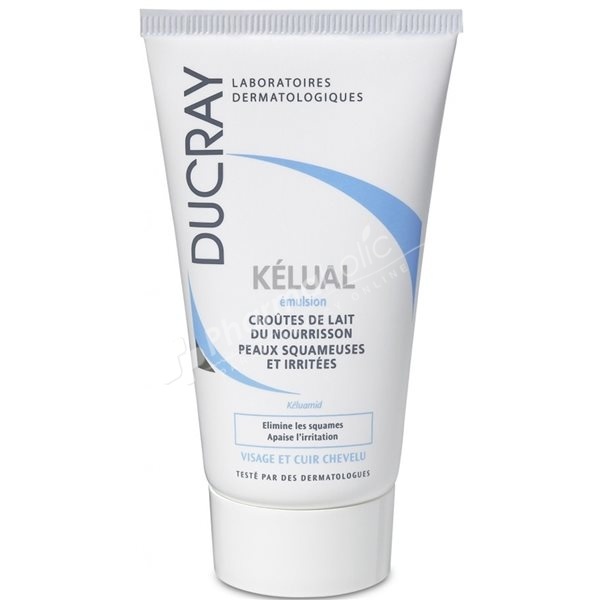 Ducray Kelual Infant Cradle Cap Emulsion eliminates the scales and soothes the irritation of the face and the scalp. This emulsion contains a patented active substance calles keluamid, which encourages the elimination of scales in flaking skin. Used as a complement to treatments for facial seborrhoeic dermatitis and cradle cap in infants, Kelual Emulsion helps relieve itching and soothes redness frequently associated with these conditions. Fragrance-free. Tested under dermatological control. Apply to a clean and dry skin. Let stand in case of seborrheic dermitis. A distinct improvement is visible from the 1st week of use, but it is advisable to continue the treatment for 1 month to maintain the good results. Aqua, Acetamide Mea, Glycerin, PEG-12, Cyclomethicone, Mineral Oil (Paraffinum Liquidum), Petrolanum, Acrylates C10-30 Alkyl Acrylate Crosspolymer, Benzoic Acid, Carbomer, Chlorphenesin, Phenoxyethanol.